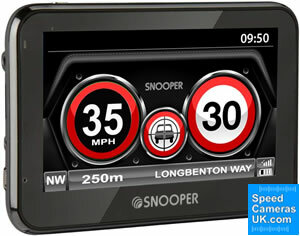 Snooper MY-SPEED XL provides speed limits for every road across the UK and Western Europe. It will also tell you when you are exceeding the speed limit. You also get a FREE AURA Speed Camera Database for the UK and Western Europe. Buy accessories for the Snooper MY-SPEED XL. 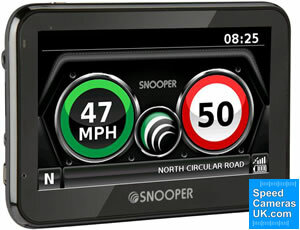 The Snooper MY-SPEED XL features a database of speed limits for all roads across the UK and Western Europe which is provided by Here Maps. The MY-SPEED XL also uses the AURA speed camera locations database to warn you via GPS technology to speed cameras in the UK and Western Europe. Furthermore these two databases are FREE for the lifetime of the this speed camera detector and speed limit warning system. There is also a built-in rechargeable battery providing 3 hours of battery power for cable free operation. When driving above the speed limit your speed will be circled in red with the road speed limit on the right. When driving below the speed limit your speed will be circled in green with the road speed limit on the right. If you select the Smart Mute feature then you will only receive warnings to speed cameras only when driving above the speed limit. If you are driving above the speed limit and you reduce your speed to below the speed limit then with Smart Mute feature 'on' the alerts will be muted. You can download the speed camera database as often as you like for FREE. However, the speed limit database is only downloadable once per year. A microSD card is included in the box to store the Speed Limit Database and AURA Speed Camera database. The windscreen bracket and car charger are also included in the box when buying the MY-SPEED XL. Learn even more about the Snooper MY-SPEED XL by reading the manual. Please click the PDF logo below. The manual opens in PDF format. 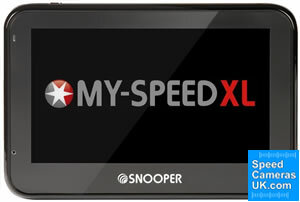 Question: I am interested about Snooper MY-SPEED XL. I understand that it has a battery life of 3 hours. Can it be charged connecting to a car socket. Will it detect mobile speed cameras as well. Answer: The Snooper MY-SPEED XL includes a 12V-24V vehicle power cable in the box (when purchased from SpeedCamerasUK.com), so yes it can be charged in car using your vehicles' cigarette lighter socket. The Snooper MY-SPEED XL doesn't detect mobile speed cameras as unlike the Snooper 4ZERO Elite BT it doesn't feature a radar or laser detector. However, the Snooper MY-SPEED XL gets it speed camera locations via a free to update AURA GPS database which includes fixed and mobile speed camera locations. So you will receive alerts to mobile speed camera locations within the AURA database. Question: I have seen these new yellow tubular cameras that flash situated on the left side of the gantry on motorways every now and then, will they be detected by a snooper my - speed xl? Answer: They sound like they could be HADECS speed cameras. If this is the case, then yes they will be in the Snooper AURA speed camera database which the Snooper MY-SPEED XL uses. 1) so can update day/week/month/ or once a year. 2) police vans camera any way and gives u time to slow ? 3) hand held version as VANS time? 4) speed on item 30 is the right speed on data base? 1. Yes, you can update the Snooper MY-SPEED XL as often as you like. 2. Police and other mobile speed camera vans are undetectable by the Snooper MY-SPEED XL as unlike the Snooper 4ZERO Elite BT, the MY-SPEED XL does not feature a radar and/or laser detector. You will receive alerts to mobile speed camera location, but these will only be via ones programmed into the GPS database by Snooper. 4. The speed limit database is provided by here maps and updated once a year. There may be some errors within this database over the course of the year, as speed limits are reduced/increased by local authorities. Question: Snooper MY-SPEED XL the pdf manual suggests that there is a subscription for the Auora? database of £29.99 each year. The information of your website page suggests that there is no subscription required. Could you clarify please? Answer: I can confirm that despite the Snooper MY-SPEED XL PDF manual mentioning a subscription charge, there is in fact no subscription to pay either for the speed camera updates or the speed limit updates. 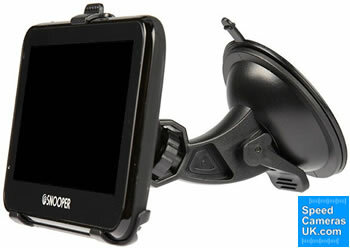 Snooper MY-SPEED XL includes windscreen mounting bracket and a cigarette lighter car charger. There is also a microSD card for storing the speed camera database and the speed limit database. You should locate the MY-SPEED XL in a place where the device can been seen by the driver without restricting the drivers view of the road ahead and also whereby you can view the system without taking you eyes off of the road ahead to maintain safe driving at all times. The Snooper MY-SPEED XL should not be left plugged in to the cigarette lighter adaptor when you start your vehicle as power surges can cause damage to your unit (the cigarette lighter socket is prone to power surges). Your computer must have an Intel Pentium Class processor or equivalent, a minimum of 32MB of RAM, 20MB of free space and a spare USB connection. The computer monitor must have 256 (8-bit) colours or greater and you also must have a CD ROM drive. The My Speed will only operate on Windows computers. Specifically, you must be using Windows Vista, Windows 7, 8, 8.1 or WIndows 10. It will also only work with Internet Explorer 6 or Netscape Navigator 6 or above. Snooper software does not support WIndows 95, 98, Millennium, 2000, XP or Apple Macintosh operating systems. There are no subscriptions to pay with the Snooper MY-SPEED XL. Both the speed limit database and the speed camera database are FREE for the lifetime of the product. Snooper MY-SPEED XL - What's in the box? If you require additional accessories for the Snooper MY-SPEED XL these can be purchased via the Snooper MY-SPEED XL accessory page.